We’ve done a lot of knitting and now it’s time to put it all together! There are a lot of moving parts on this step but it’s really just one row that we have to work. 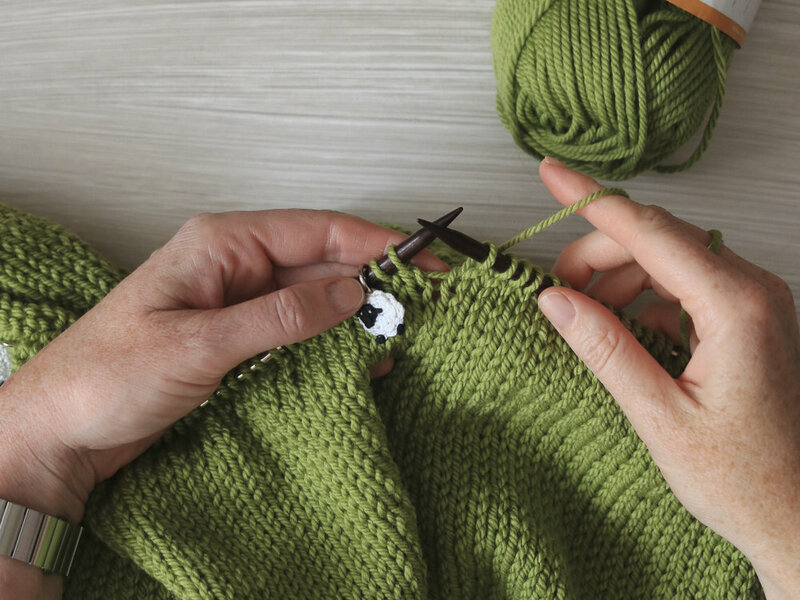 We're about the join the sleeves to the body and create the yoke of the sweater. Here we have our pieces! The body is knit up to the armholes and each sleeve is worked to the same place. There are stitches on holders waiting at the underarms but otherwise we're going to work all of these stitches into one piece. I like to have all of my stitches on needles for this type of work before I start the row. That way I don't have to stop midway through. Here I have my body on my longest gauge-size circular needle. Everything will be transferred to this needle so it's best to have the longest cord you have. My sleeve in the upper left is on a shorter cord with below-gauge needle tips and my sleeve in the upper right is on a set up DPNs. And have your 4 stitch markers ready, too! Let's get this crazy row started! Join your yarn to the leading edge of your sweater. Start with a ball that still has a lot of yarn on it so you know you'll make it through this section. Work across the Right Front stitches and place a marker on the needle. The numbers on the pattern should have land right at the right armhole. Then it's sleeve time! Using your working yarn begin knitting the stitches from the sleeve on to the body needle. The pattern calls for 42 sleeve stitches and that's what I had. Phew! There it is! The first sleeve is attached. We place a second marker and knit across the back of the body. Smooth sailing. The second sleeve should be just as easy but it's a little insane looking with the double-points. Nobody but a knitter would understand what's going on here! Place a marker and move around your stitches. OK! Look at that -- both sets of needles are on the table and I'm placing my last marker. Just the left front left to knit. And, done! Looking from the top this is a long and wild row but we have everything on there and all the parts aligned. Our next step is to knit 5 more rows even. As you work these stockinette stitch rows the sections at the sleeve might feel a little tight moving around the needle but it gets smoother at every row. Just shift the stitches around the cord to make it more comfortable. Then we get to the part that makes the Carbeth Cardigan so unique -- the decreases! We're going to create those stunning lines up the yoke with only stitches, no seams. Every row of the yoke gets smaller by 4 stitches so I think it will go fast. We're ready to start the sleeves for our Carbeth Cardigan! These sleeves work up fast because they're in the round and don't require a seam. One of the questions I've been asked most about this project is, "Should I work the sleeves on double-pointed needles or with magic loop?" Well, my answer is ... It's up to you! 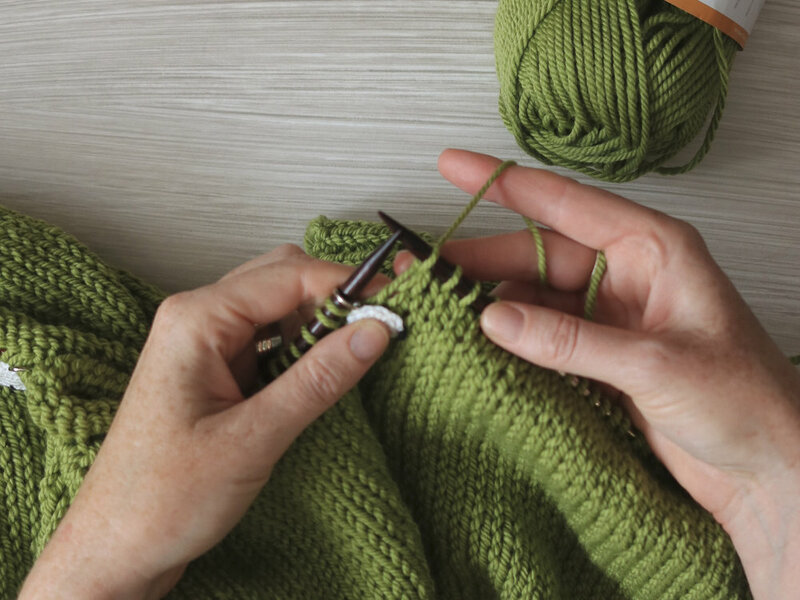 Both methods are great ways to knit small circumference projects. Double-pointed needles or DPNs are the tried and true technique for knitting small items in the round. We use them for closing the top of hats, small stuff animal projects, or sleeves like this! Here's a great tutorial on getting started with DPNs if you're unsure. Magic loop is also a great technique if you happen to have another long cord for your interchangeable needles. You need at least a 32" needle to handle the number of stitches for this project. Here's a very clear tutorial on how to get started with Magic Loop. 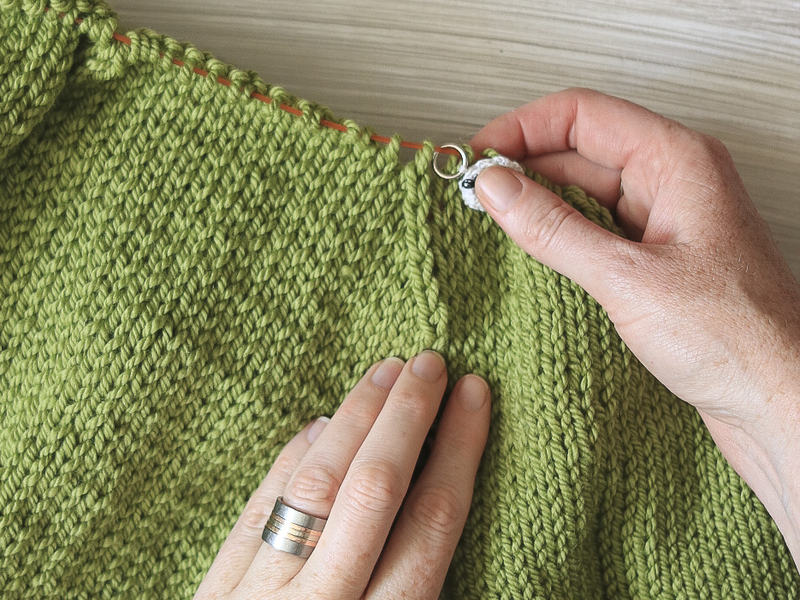 Don't forget to start the sleeves on your smaller than gauge-size needles -- I'm using US 10 (6 mm) for my ribbing. We work 20 rounds of ribbing before changing needle size to gauge-size -- US 10.5 (6.5 mm) for me. ALSO! If you're working with DPNs, don't forget like I did to change each needle for a larger one as you go around. Silly mistake! ha. Just like our arms get wider from the wrist to the bicep so must our Carbeth Cardigan sleeves. We work the ribbing and then build each row increasing a set amount up the arm creating a beautiful triangle. Step A: K1, m1L, k to 1 st before marker, m1R, k1. 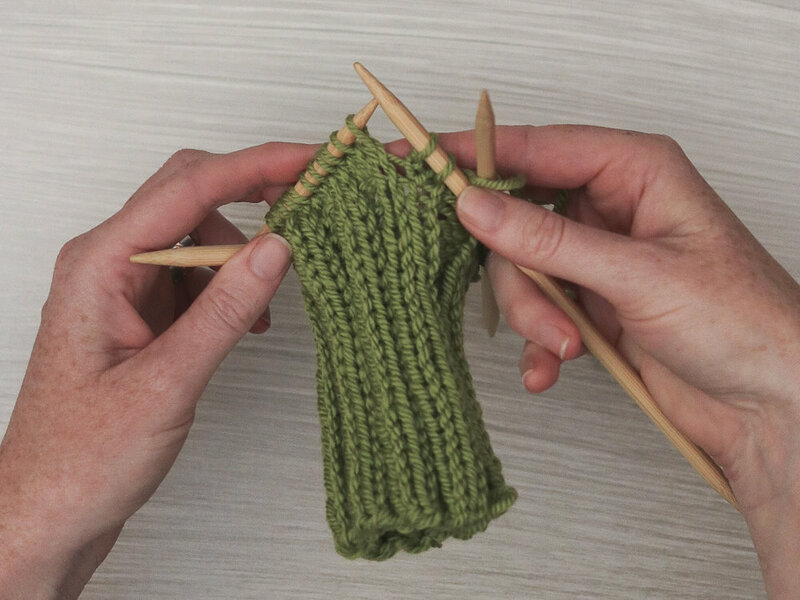 Instructions: With the left needle, pick up the strand between 2 stitches from front to back, and knit through the back of the stitch. Instructions: With left needle pick up the strand between 2 stitches from back to front and knit through the front of the stitch. One thing to keep in mind about these increases is that they should feel hard to work -- almost like you're doing it wrong. 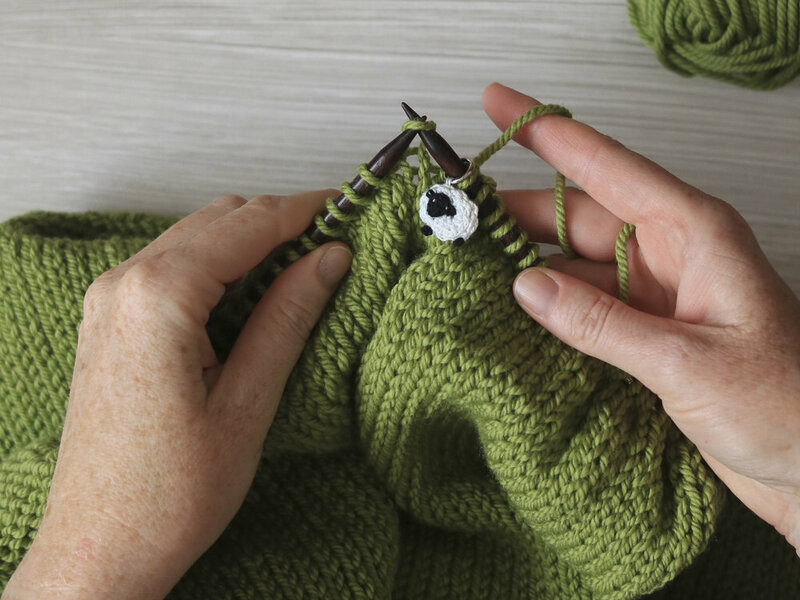 If the stitch feels easy then it might make a hole instead of a tight stitch. Take a minute and try again. A friend once told me a way to remember m1L versus m1R: m1leFt means your needle goes Front-to-rear and m1Right means your needle goes Rear-to-front. Thanks, Sohini! I think this is a great memory tip and it will definitely help me to remember which is which for the rest of my knitting life. Work the sleeves until the increases are finished and your sleeves measures the suggested length. I added a few inches after I completed my increase because, much like my body, my arms are long. Try your sleeve on as you approach the last increase and decide if it's long enough or if you'd like to add a little more distance. And don't forget to make a second one! We are knitting the Carbeth Cardigan by Kate Davies using Ewe Ewe Baa Baa Bulky yarn. 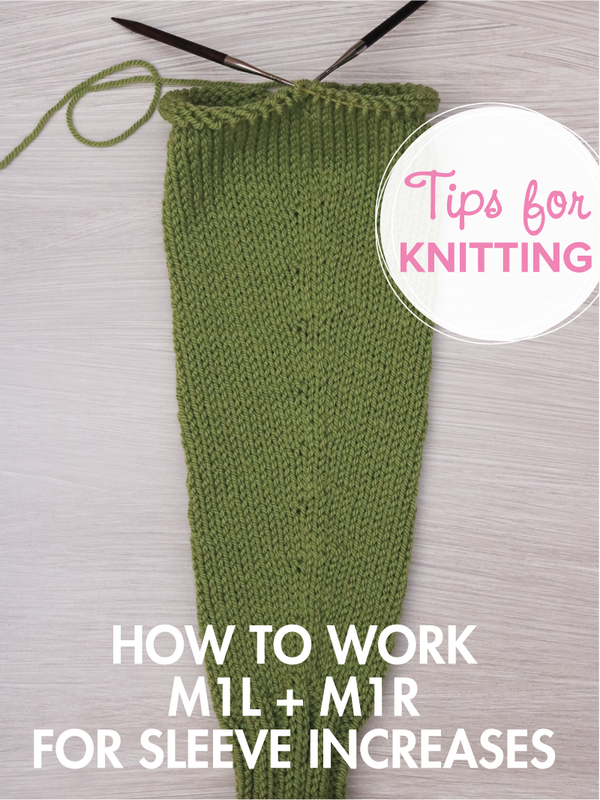 See our knit-along posts. Here we are at the place where we’re done with our sweater body. We need to move some stitches around before we move on to the sleeves. The Carbeth Cardigan is knit from the bottom up to the neckline and at this point we are done with the body and we’re going to hold these stitches until it’s time to attach the sleeves to the body. At this point we will rearrange the stitches to set aside a few for the underarms. We slip the stitches around the needle without knitting them — see my working yarn at the beginning of the row? The size I’m working says that I remove 4 stitches on either side of the marker so I slipped over to that point. Be sure to slip your stitches purlwise for this because knitwise will twist them and it will be visible later. Thread a darning needle with some scrap yarn and move the required number of stitches — 8 for me — over to the yarn. I tie it in a little bow to secure. Now we continue moving around the sweater bridging the gap just created by the underarm. Slip to your next marker and move those stitches. Now we have all of our body stitches sorted out! I’m going to leave the main stitches on my interchangeable needle cord. I attached the stoppers and I’ll set this whole piece aside until we need it again after the sleeves are knit. Sleeves start Wednesday!